The penultimate part is, at last, here! GR: As we leave North Parade onto Queens Road we pass a rather grand Edwardian building with iron railings to our left, on the very corner of the two roads. C: I see it, sir. GR: It was here that until the early twentieth century a temperance hall stood, and opposite us, where there is now a small car park next to the red brick and stucco house, there stood a church. C: What is a temperance hall? GR: It would have basically been a huge coffee house, a creation of the temperance movement in the early nineteenth century when more and more people were supporting a ban on alcohol and to try and spread their cause they set up huge halls where their supporters could meet away from pubs and other meeting houses of the time, where temperance was frowned on. C: I see, and was it linked to the church opposite? GR: I cannot say, but they were likely built around the same time, probably in 1840 or so. The church was built for Welsh Calvinists and stood until at least as the sixties, finally being pulled down after it was too dilapidated to repair without extreme cost. C: A shame, if it was anywhere near as fine as the other churches in this town I should have liked to have seen it. GR: Well, there is still some history standing yet; if we move a little way down Queens Road we can see a rather nice white painted house on the right, with two semi-circular bay windows and a large ship building archway beside it. C: With the columns either side of the door? GR: Yes, that’s the one; that is Sandmarsh Cottage (possible at one point in the nineteenth century being an inn called the Neptune) and it is the last sign of this road’s old name – Sandmarsh Road – it was the first house built in this road and one of the first permanent structures built on the sandmarsh; it’s construction here was the beginning of Aberystwyth’s growth north into an area that since the stone ages had been flood land that absorbed the storms of the sea. C: So not the ideal place for your summerhouse, then? GR: Surely not, and this road was often flooded before the promenade and sea wall were built. If we walk a little further we find the pub currently called Scholars. C: I have heard it is a good place to drink. GR: I agree firmly, sir, and it has been so since the 1860s when it first opened as a pub, although then it was called the Crystal Palace, at some point after 1890 it was extended into two properties rather than the original one. It only changed its name in the 1980s and has since been the fine establishment you see today. C: I see. But what is that fine columned building I see distantly? GR: Come on, follow quick and let us stand before it and I will tell you of it. C: Very well, my guide. GR: This is the town hall that was built after the old one on the spot of the town clock was demolished. C: It is a fine building! GR: Sadly, it is a shadow of the former grandeur that stood here when it was first built in 1857. The original town hall on this site was built after the Talbot Hotel was demolished and had a much grander face than what we currently see. Gr: It was a slightly shorter building than the one that stands now, with larger columns and grander windows. The doorway is the only original shape in the structure that stands now, although all the stone detailing is gone from around it. C: And why was it changed so much? GR: On September 8th 1957 a fire broke out and damaged the town hall irreparably before it could be put out, much of the hall was demolished and this new building raised in its place. It is a fine building, but sadly not as grand as it once was. C: It still makes a well presented addition to this well-proportioned square though, I would say. And I see that this town has even more churches here! GR: When the town hall was built there was not a church there, where you see it now there was up until the end of the nineteenth century an ice rink, which was one of the main attractions that brought people to the hotels in this road. In fact, opposite that, there is The George, a hotel that was built in the nineteenth century as one of the smarter hotels in town. C: It sounds like quite a smart part of town. GR: For sure it was, now, please, let us go a little further down Queens Road. C: Lead on, my guide, lead on. GR: We come first on our left to the newly built Methodist Centre of St. Paul’s, built on the site of an English speaking Methodist church that had space for four hundred. Just beyond it, on our right past the red windowed house, is a small brick built building that resembled a Victorian garage. C: Oh yes, and what history lies there? GR: That was built in 1875 to hold the Aberystwyth lifeboat, which first set up a station here in the 1860s; it was the base for those heroic sailors in the early days of the RNLI, and was where, on the 18th May 1922, the boats were rushed to the rocks just outside Aberystwyth to rescue the crew of the foundering trawler called the Princess Mary, who were only saved thanks to the station being so close to them. C: Truly an important building, then. GR: A part of maritime history, of which there seem to be far too few for such a town as this, if we continue on there is a rather fine house with an iron balcony, separate from the terraced houses beyond it. This is the small Aberystwyth courthouse, although it may not look it, and has seen enough of Aberystwyth’s criminal society go through its doors in the course of time. C: I would never have thought it to be a courthouse. GR: It certainly does not look like one. Now, I’m afraid my time to speak with you grows a little short, so let us move on a little quickly, if you would be so kind. C: For sure, go, my guide! GR: If we walk a little further we are outside St. Winifred’s; a catholic church and, I must say, probably my favourite church in the town, since it is a rather beautiful building that seems a little more elegant and homely than the austere fronts that make the other churches in Aberystwyth. C: It is a rather nice building. GR: Yes, and beyond it on the left, on the corner of North Road, is the old town fire station that weas built in this end of the town in about 1890. Behind them in 1923 there was built the College Hall, a rather grand hall used by the university, which burnt down spectacularly and slightly mysteriously in August 1933. C: A mystery? It seems a lot of parts of Aberystwyth have burnt down without reason. GR: It would seem so. Now, if we go left at these cross roads here we can finally have a good walk along the Victorian promenade. C: Ah, you left the best till last? GR: Why, what did you expect? Going ahead of us there is the end of Queens Road, leading up to the Victorian railway to the top of Constitution Hill – a route I would recommend you take some day to enjoy that view. Mesolithic worked stone found up there suggests that Constitution Hill has been used as a vantage point for viewing the lands around it for at least ten thousand years. C: Such a long time! It might as well have been souls who had only just fallen from the doorstep of Eden that walked upon that place. GR: Yes, but let us return to Aberystwyth as the town it is today. If we go left at the crossroads now we go down Albert Place to the seafront, with Queens Hotel to the right – presently council offices – the grand building was in fact used by the university for lectures during the restoration of the Old College at the end of the nineteenth century. C: Ah, and look at the sea! Such a view! GR: Truly, I think I will end this walk before my time is up with a little walk by the sea. C: Yes, my guide, let us do that. We are getting to the end, at least. GR: Follow me then, for we now head back into the main thoroughfare of Victorian Aberystwyth. GR: As we approach the first crossroads, where Portland Road and Eastgate Street meet, we have on either side of us two buildings; to our left, a white building with few remarkable features, and to our right the fine figure of Edwardian arts and crafts-nouveaux that is presently The Varsity. C: Yes, I do see as much. GR: The Varsity has been an established pub all its life, and has also been called Rea’s Tea Lounge and The White Horse. The white building opposite it was also a hotel for a little while, while opposite us, on the other side of the junction is Salt, at one time the Central Hotel. C: There are not so many hotels now, it seems. GR: I would agree, sir. A little further down we pass on our left a building, presently WHSmiths and originally the offices of Cambrian News, which replaced an old Georgian public hall, where balls and dances took place throughout the nineteenth century. C: I see, I see, but there seems to be more architectural interest here, not true history, my guide. GR: True, I do go off subject again; you get a taste, I think, of how long my historical ramblings would be if only we had a coffee house and a long day for me to lecture upon it all. C: I am glad, perhaps, that I do not have so long. GR: I wish the opposite; but hasten to add that length is not my aim for this walk, enjoy, perhaps, these shortened words, and we will carry on to North Parade and examine the history there. C: Carry on, please, my guide. GR: We enter into North Parade between the fine façade of the old London and Provincial Bank, finished in 1906, and the slightly dilapidated remnants of Burtons, which echoes only the smallest shadow of the art deco finery that made the King’s Hall that I mentioned earlier. Trees originally ran either side of North Parade down the entire length, of which there are still some trees today; if it weren’t for the traffic this would be one of the nicest main roads I can really think of. C: True, on a summer’s day this street must be quite an enjoyable walk. GR: For now, I’m afraid you shall continue to enjoy it with the drone of history in your ears. C: Oh, I have no complaints about that. GR: On our right as we go down this road, just after the café called Caesar’s, there are three fine stone buildings with colonnaded doorways – two of the ionic order and one of the doric – which are, in my opinion, the oldest buildings on North Parade, and probably date from about 1810. This road, before the first few Georgian buildings began to appear, would have originally just been a track leading to the town – to our left there would have been a sand marsh, stretching out to the hills to the north, while to our right there would have been meadow land with a few fields leading out towards the horizon. As mining became an improved art in the eighteenth century there were a few foundries set up to our right, set back a little from the road. C: It seems much changed now, my guide. GR: Very changed for sure. Now, if you will follow me down to the end, we will take a look at Queen’s Road. C: Onwards, my dear guide! 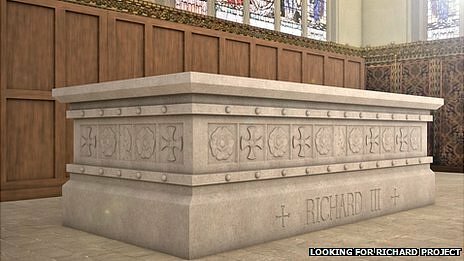 It’s been nine months now since Richard III, the last medieval king of England, was found in the long dismantled remains of Greyfriars in Leicester, peacefully residing in the same tomb dug for him over five-hundred years ago. For the preservation of his remains and for the respect of his memory, it’s long since been decided that his remains shall be inhumed in Leicester Cathedral (I won’t go into why not York Cathedral since he’s a Yorkist king, or even Westminster Abbey along with 17 previous monarchs). Anyway, new plans have been unveiled for his tomb and just look what they’re planning to do with poor Richard. Less like a tomb, more like a fountain that wouldn’t look out of place in a 1960s multi-story car park. Did 1960s multi-story car parks have fountains? Is that analogy valid? I’m not sure, but I suppose Richard’s remains were under a car park now so maybe they’re just making him feel at home. Or maybe I should learn more about car parks. When looked at in comparison with the tombs of any other monarch it’s quite easy to see why this design hasn’t won many fans. It is not only plain, but there isn’t even a hint to the regal nature of the tomb’s occupant. Richard III lived in a very different England to the one we know now; there was no Church of England and, though the church as it exists now considers itself to still contain some of the ancient Catholic ideas of the medieval English church establishment, it is still a very altered faith. The tomb reflects this new view and, rather than a grander tomb that looks back upon the older ecclesiastical practices of Richard’s time and his beliefs, it seems much more reminiscent of modern plain, protestant ideas. Perhaps, then, you’ll say that it is a modern church with a modern faith; it is modern people who will be remembering him and so why not remember him in our own new way. Well, firstly I would say it is surely more respectful to lay Richard to rest with more thought given to his ideas and his time, but also he was a king of England who died defending his country, why should his tomb be so plain and anonymous compared even to recent kings and queens of this country? This tomb of George V is a much finer example of a modern tomb for a king descended from an ancient line and would be a much better design idea to base Richard’s tomb on. Even if our monarchs are from a different line to those who ruled five-hundred years ago, they performed the same role, had the same respect from the people (mostly), and surely deserve the same standard of memorial in death. Lastly, I’d like to put forward a solution, rather than just pointing out problems. The following design was created by the society who promote the memory of Richard III and have done a huge amount of research into his life. They raised a considerable sum for the construction of a tomb, a generosity that was betrayed somewhat by Leicester Cathedral not even discussing their design with them. Anyway, with that society’s design I would like to humbly end this post, and hope that they do something more like this with Richard. Aside from a terrible title, I also bring you a terrible poem this week. Because any good story is worth embellishment. I would have produced it earlier, but the original lines written just after the last terrible Aberystwyth storm were recently eaten by my phone. Enjoy. And sent my glasses God knows where. Now briny black with sea-salt trim. Flew high though ill designed for that. Were swimming in the bowling park! I’d take a coat with me next time. Until next time, good reader. C: Ah! More grand churches, there are certainly very many. GR: There are but a part of how many stood a century ago, I can think of at least four or five that have been dismantled in the last hundred years, but indeed this road does hold some very fine examples of them. Firstly, on our left there is the Welsh Congregational Chapel, which can seat 685 people, and was built in place of four earlier houses which had, in turn, been built directly on top of the old town wall. It was finished in 1878 and houses one of the oldest organs in Aberystwyth. C: And I see another ahead. GR: Yes, just a little way further is a Welsh Baptist chapel, built in 1889 to seat 600, it is an impressive building indeed. And just to the left of these are two old pubs that have lately been closed; the Victoria and the Hope and Anchor, the former marked by the ship’s figure head on the corner, and the latter now being the shop on the opposite corner. C: I see, I see, and where next? GR: Let us cross the road into Alfred Place. GR: Yes, but an English one this time, finished in 1870 – it is a rather nice example, and I suspect one of the last we shall be walking past for a while. C: I suspect we shall see some more sooner than I expect. GR: Come, now we should go down Corporation Road to the right ahead, but take a look to the left, where a row of houses called Crynfryn Buildings stand directly on the old town wall and mark its path. C: And what lies down Corporation Road? GR: Not so much now, but there was a time when the end was flanked by two pubs; the Welsh Harp to the left and the Old Blue Bell to the right, common haunts of early tourists to the town, at the end of this street we will leave what was Georgian Aberystwyth and enter into part of the town that has only really been around since the mid nineteenth century. C: Ah, we are certainly out of the back streets now! GR: Certainly, sir, but it is strange to think that, though this is now part of the centre of Aberystwyth, there have only been houses stretching ahead of us since about 1850. C: Ah, but they are fine buildings are they not? GR: Some of the finest pieces of Victorian and Edwardian Aberystwyth can be found here; if you look to your right, on the other side of Terrace Road from where we stand now there is the tall classical façade of The Coliseum; it was originally a grand theatre and later the town’s second cinema, it still contains the entire theatre as it was when it was built in 1905. C: Such a grand building! And who stands at the top of the gable there? GR: There are three street fronts; one in Bath Street, one in Portland Road, and one in this road, and each is topped with a complete figure of Edward VII, who was king at the time as well as the longest serving prince of Wales other than the current prince. The building is built, unusually, in a T-shape because the builder didn’t manage to persuade the owners of all the houses around it to sell up, so the building ahead of us on the corner of Bath Street, as well as the house on the corner of Portland Road, still stand as they were in the nineteenth century. C: How odd, indeed, and I see to our left that there is a little square for people to enjoy the view of that fine theatre from. GR: It was not always so, I must say. GR: True, my friend, true! What you must remember is this was, a hundred years ago, the heart of a growing and thriving tourist town. Ahead of us is Bath Street, where, in place of the cinema that stands there now, there was once a huge public baths built in 1880 to allow visitors to swim without having to get into the icy cold sea. C: There seems that there was a lot more then for tourists to do then, other than shop and go to the beach. GR: Perhaps, there is plenty yet that I have not shown you of what this fine town has lost, but plenty more has been gained since then. Including, as it happens, that ‘little square’ to our left. C: Oh? What was there before? GR: Originally, when this road was first laid out, that plot contained eight or so terraced houses built in about 1850. In 1910 they were pulled down and a huge hotel called the Waterloo Hydro Hotel was put up there; it faced the sea and was five floors high, with a balcony along the front and plenty of bay windows so that the rooms had some of the best sea views in the whole town. C: Sounds like a fine place. GR: It surely was, but it was unfortunately burnt down only a few years later in 1919. The rubble from that place was finally cleared entirely in the 1930s and one of the most fantastic pieces of this town’s twentieth century architecture was built there; the King’s Hall, originally called Municipal Hall. Finished in 1933, it was a huge building that took up the entire plot and was constructed in the classic art deco style that the country loved at the time. A balcony balustrade ran around the flat roof, which was broken on the centre of the seafront side by a great clock tower topped with a flag pole. C: Very nice. But there is little to admire of it now. GR: A shame indeed, but true, the building saw famous names from Margaret Thatcher to Led Zeppelin go through its doors, but in the end it was pulled down in 1989, which is when the site became how you see it now. If you willow follow me, then, we will continue our walk a little way more. C: Ah, back here? I already know this place somewhat, are we doubling back already? GR: Not at all; it is time, I think, to take you down what has become the main street in Aberystwyth, which in the Medieval town led to a great gate called the Great Dark Gate, hence the road name. This gate was the main gate in and out of the town and would be visible about 120 meters away from where we are now. C: And we will make our way towards that place now? GR: Aye, for sure, let us take a walk there now, and I will illuminate some shadows of history along the way. GR: This road has always been the centre of commerce within the town; we are now walking away from the old market places down through what would have consisted of many taverns and inns before the eighteenth century. We pass on our left Market Street, which led through to the old market square, and then a few houses down find a fine looking pillared building, which is HSBC at this moment. C: I see it, and with the Welsh dragon and feathers over the arch. GR: Yes, well observed, it was built between 1908 and 1909 for the North and South Wales Bank; a fine work of architecture if ever one was built. C: It is true, but I would far prefer to hear of history than of pretty buildings. GR: Agreed, sir, let me show you on. GR: Here we are, then. This junction marks the spot where, in about 1300, a great stone gate was constructed that quickly became known as the Great Dark Gate; a daunting crenelated gateway that would have been the main access point for any merchants or travellers trying to visit the town. It stood eight feet and nine inches thick – almost three meters – and was most probably built to be, like many medieval town walls, only three or four meters high. The gate itself was probably flanked on both sides by small towers, although probably nothing to match the grand towers of the castle, and would have had a grand wooden door with iron studs. It was just outside these gates that merchants would often congregate and sell wares without city taxes being imposed upon them. C: And all gone? How long did it stand for? GR: It stood certainly until 1600, and was probably dismantled about a hundred years after that, around 1700, when Wales was entirely peaceful and improved medical practice meant that there was less fear of plague entering the town. C: So it stood for about 400 years? GR: Quite so, and Baker Street and Chalybeate Street running either side of it follow the exterior route of the old wall. There is enough history hereabouts; the building on the left side of the traffic lights was once the Victorian town police station, and the NatWest bank on the other side of the junction is a grand Edwardian bank built in 1903, and has been a bank ever since. It was at this police station that policemen had to hold off five hundred locals as well as soldiers during the 1922 August riot, when the police arrested a few soldiers for being drunk and disorderly and found themselves having got themselves involved in trouble that was more than they could handle. Now, if you wish, we will go left down Baker Street and follow the old town wall towards the sea. C: Gladly, sir, lead on!